If you’ve been to our office recently, you’ve probably noticed we’re out of space. Food is replenished as soon as it leaves. A commercial freezer was donated last month, but it is in loaned storage as we have nowhere to put it. Piles of clothes are everywhere because the donation room is overflowing. We started a building expansion initiative called 50K50Days and together we’ve raised over $10,000 so far. If 1,000 friends can give $50, we can finish the addition on the back of our building. We’re trading rent to add space. WOULD YOU be a part of a dynamic initiative? 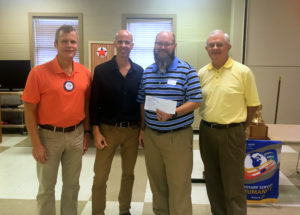 On August 11th, the Rotary Club of Vestavia Hills presented Grace Klein Community with a donation of $1,000.00 toward our office expansion and food ministry. They also provided an opportunity for us to receive an additional $500.00 donation match. Several members of the Rotary Club of Vestavia Hills have volunteered with Grace Klein Community by taking their time to assemble food boxes and deliver them to families in need. One of the members also assisted by providing contacts and answering many questions that we had about disassembly and re-assembly of a walk in refrigerator/freezer that was recently donated. Grace Klein Community is thankful for the partnership and support of the Rotary Club of Vestavia Hills.